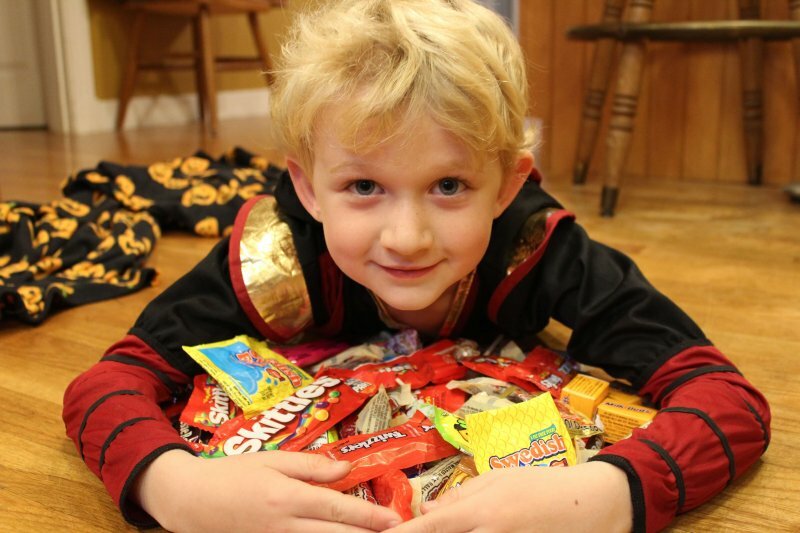 Inside: For Food Allergy Families, trick or treating is the scariest part of Halloween. But there are safe ways to trick or treat with your food allergy kiddo. Halloween absolutely terrifies me. Not because of the thriller movies or haunted houses or black cats crossing my path. It’s the trick or treating. You see, my son has an anaphylactic allergy to peanuts. When he goes trick or treating, he is literally being handed something that could kill him. So some people question: why would I let my food allergy son trick or treat then? Because how could I not? How could I not let a 6-year-old dress up as a ninja and run through the streets with his sisters and neighbors? How could I make him stay home to pass out candy while every other kid in his neighborhood is getting candy? I think being stuck at home would do more damage than a Snickers bar in his candy bag. I let him trick or treat because I don’t want him living in a bubble. I want him to have as normal of a childhood as he can. And at the end of the day, if we’ve done everything to keep him safe and he still has a reaction, that’s what the epi pen in my back pocket is for. And there are safe ways for food allergy kids to trick or treat, so we prepare. I buy bags of Skittles and jelly beans and Twizzlers so I can “trade” him when I confiscate all of his peanut candy. We only pass out peanut-free candy. 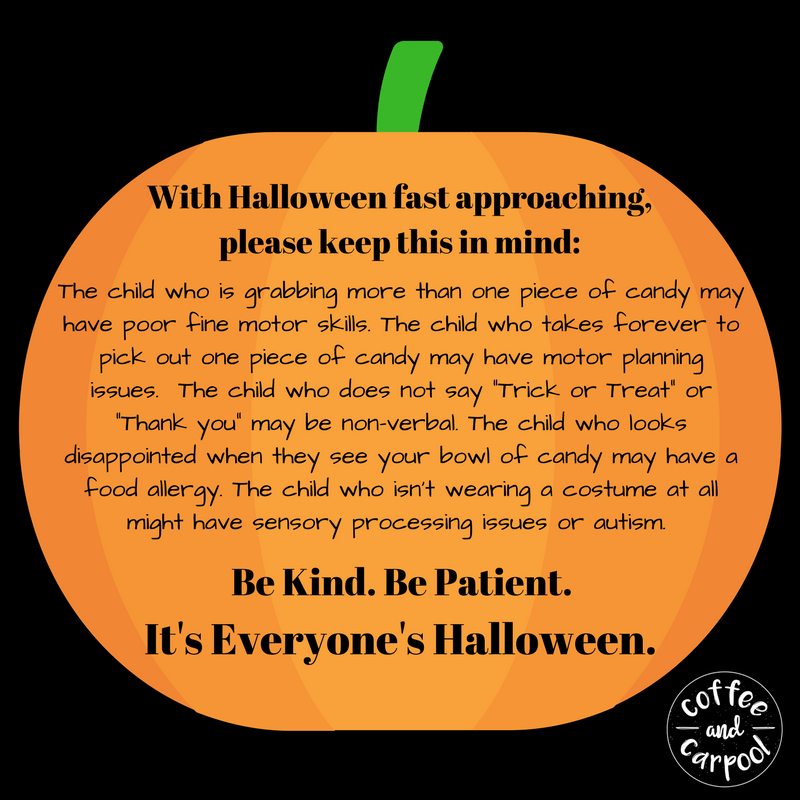 And we always participate in the Teal Pumpkin Project and hand out non-food items for other allergy kiddos like glow sticks, pencils or stickers. To get a Teal Pumpkin, click here! But most importantly, I trick or treat with an ambulance ride-ready purse: two epi pens, my wallet with an insurance card and a fully charged cell phone with an extra charger. I also tie a sweatshirt around my waist because hospitals tend to be super cold. We also discuss-ad nauseam- how he can’t eat anything until we read the labels. There is no digging through his pillowcase to sneak a piece of candy between houses. He knows about “bad chocolate,” as he calls it since the day he accidentally ate a Mr. Goodbar. He nods through my lecture with saucer-sized eyes every time we have the conversation. I hate that I have to scare him, but it’ll keep him safe. So his squeals of delight and his little boy voice echoing “trick or treat” makes it all worth it. He loves dressing up and he loves trick or treating. He loves Halloween. But at the end of the night, our post trick or treating ritual is a little different than most families. There’s no rummaging through the loot to trade candies. There’s no popping candy in your mouth as fast as you can find your favorites. All three of my kids’ candy goes in one giant pile and I go through it all, piece by piece, meticulously hunting for peanuts both obvious and hidden. We look up candy ingredients online and check manufacturing policies. We read every label. And our number one rule to keep him safe with his food allergies: If we don’t know the ingredients, he doesn’t eat it. My kids can actually help sort the candy now. They know what we can and can’t keep by the wrappers. And by the end of our sorting, I usually take away 2/3 of their stash. But they almost never come. It’s just the way it is in our family, and while they may not like it, they all get it. As my husband and I longingly look at the bag of contraband candy that we donate, (oh, how we miss Reese’s and Snickers), we end the night the same way every year. I pull my son into my arms to apologize. I really am desperately sorry I have to take away most of his Halloween candy. Because it isn’t fair. 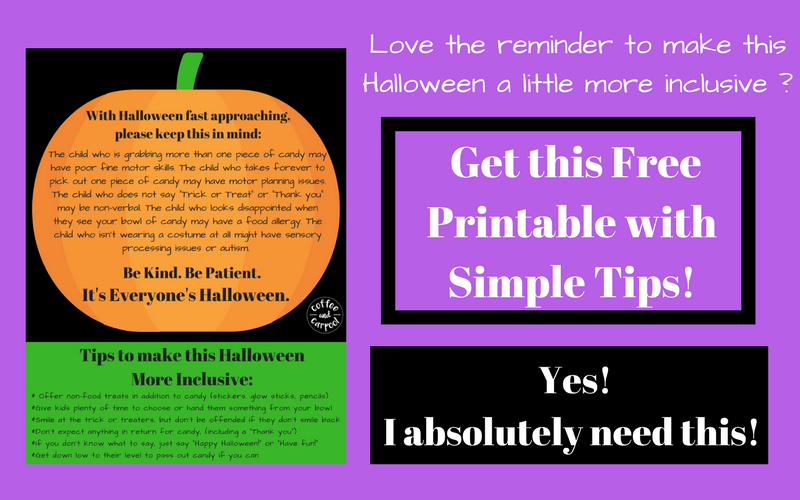 Do you let your food allergy kiddo trick or treat? What ways do you keep them safe? If you don’t have a food allergy kiddo, are you ready to be an ally and learn what how you can save a food allergy kiddo’s life? 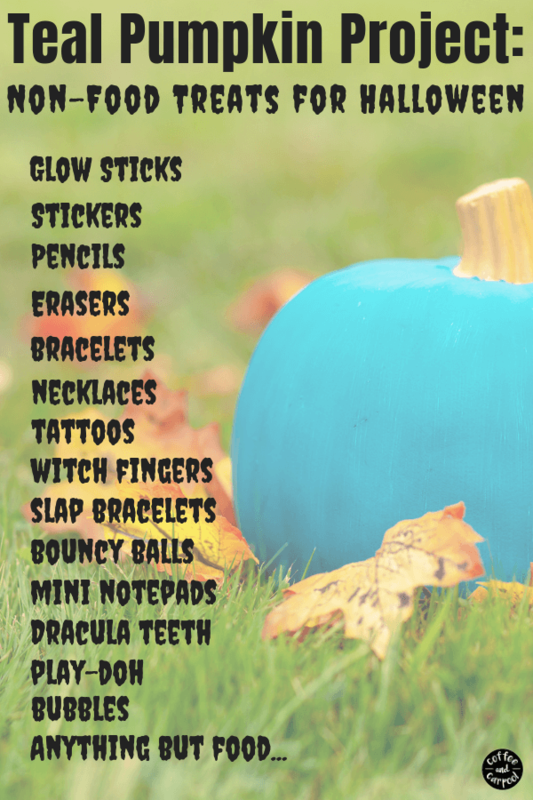 Are you up to join the Teal Pumpkin Project by offering non-food treats this year to trick or treaters? Need more food allergy awareness information? Click here. Aww, at least you buy things he can snack on to trade with him. Yeah, how could a mom not let a little one join their siblings in the collection of those sweet goods. My nephew has a peanut allergy too, i am going to get skittles and things to trade with him too. Thanks for the idea! 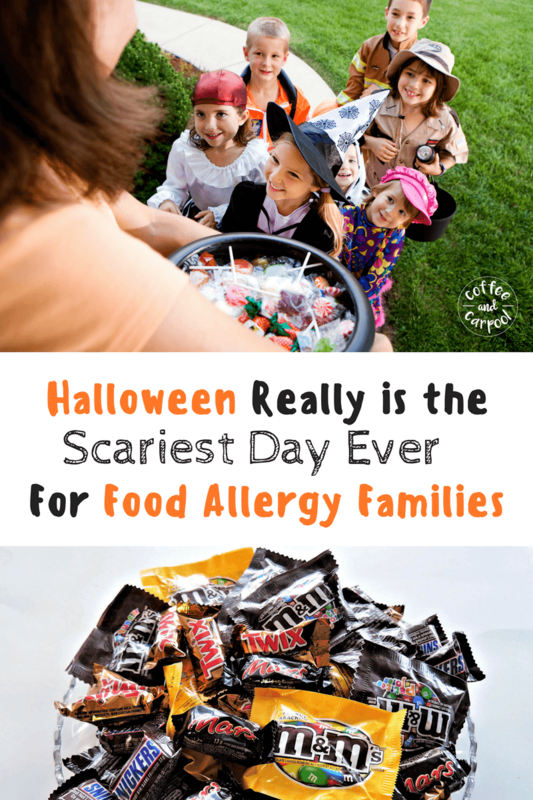 I’m sure there are a lot of food allergy parents who don’t let their kids trick or treat. For us, it’s a calculated risk. So glad you are going to trade some safe food with your nephew. It takes the sting out a little!